The Pakistan Cricket Board rejected a proposal to relax by six months the four-year ban on Test umpire Nadeem Ghauri and allow him to resume umpiring in domestic tournaments this season. The PCB's Board of Governors, which met in Lahore, rejected the proposal put forward at the meeting, insisting no relaxation should be given to Ghauri as he brought the image of Pakistan cricket into disrepute. Ghauri, who played a Test and six ODIs for Pakistan, was banned for four years in October 2012 after the PCB's integrity committee found him guilty of being willing to accept money to give favourable umpiring decisions. The 53-year-old former a left-arm spinner was caught in a fixing scandal along with first class umpire Anees Siddiqui after an Indian television channel carried out a sting operation in 2012, which claimed to have exposed eight first-class and international umpires from Pakistan, Sri Lanka and Bangladesh who were allegedly willing to give favorable decisions in return for a fee in lucrative domestic and T20 leagues. PCB chairman Shaharyar Khan had circulated a letter to all the members before the meeting, asking whether they approved ending the ban on Ghauri immediately. A majority of the members said Ghauri should serve his full ban and only be allowed to return to umpiring in domestic cricket after October this year. Interestingly, Shaharyar also vehemently opposed giving the relaxation to Ghauri. It was also decided that the PCB should step up its programmes to educate all umpires about the ICC’s anti-corruption laws and regulations. "No leniency should be shown to any umpire if he is found even remotely connected to unethical or corrupt practices," a member told the meeting. It was also decided that even after the ban on Ghauri ends in October, the board will first put him through an anti-corruption crash course before deciding when to allow him to return to umpiring in domestic cricket. Ghauri umpired on the ICC panel and supervised five Tests, 43 One-day Internationals and four T20 Internationals. 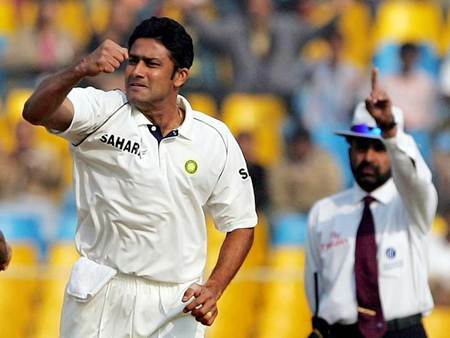 Image: India's Anil Kumble celebrates as umpire Nadeem Ghauri, right, raises his finger to signal the dismissal of Sri Lanka's Farveez Maharoof in the second innings on the fifth and final day of the third and final Test in Ahmedabad on December 22, 2005. India beat Sri Lanka by 259 runs to clinch the three-Test match series 2-0.